The purpose of dimensioning is to provide a clear and complete description of an object. A complete set of dimensions will permit only one interpretation needed to construct the part. Dimensioning should follow these guidelines. Accuracy: correct values must be given. Clearness: dimensions must be placed in appropriate positions. Completeness: nothing must be left out, and nothing duplicated. Readability: the appropriate line quality must be used for legibility. 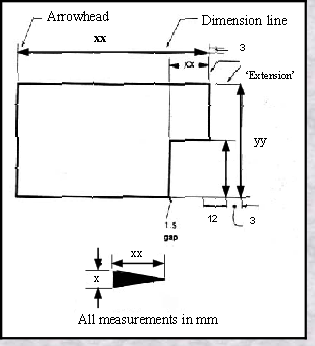 The dimension line is a thin line, broken in the middle to allow the placement of the dimension value, with arrowheads at each end (see diagram below). An arrowhead is approximately 3 mm long and 1mm wide. That is, the length is roughly three times the width. An extension line extends a line on the object to the dimension line. used to connect a dimension with a particular area (see the hole diameter arrow shown here.) 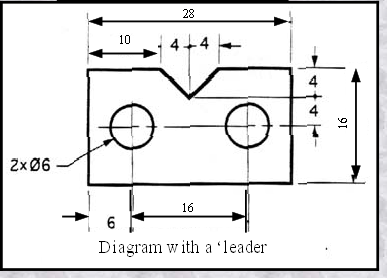 A leader may also be used to indicate a note or comment about a specific area. When there is limited space, a heavy black dot may be substituted for the arrows, again clarity is the rule - it should be a clear point into which the dimension lines ends. Also in this drawing, shown here, two holes on the main surface of the flat panel are identical, allowing the "2x" notation to be used and the dimension to point to only one of the circles. This is more preferable than cluttering the space with duplicate information.